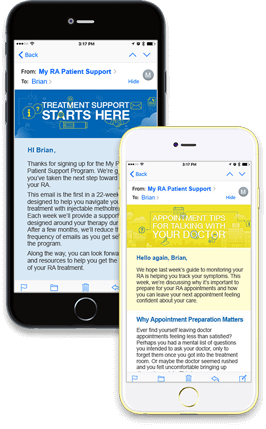 In addition to the support you receive from your healthcare team, the My RA Patient Support program, a 22-week email series, will help you navigate your doctor's RA treatment plan for you with Rasuvo® (methotrexate) injection. Medac Pharma, Inc. respects and values your privacy and any information you provide to us. Information will only be used by Medac Pharma, Inc. and its contracted third parties. Medac Pharma, Inc. will never sell or transfer your personal information to any party other than Medac affiliates and third parties in order to support the My RA Patient Support program. For additional information about Rasuvo, please refer to the Patient Information Leaflet and Instructions for Use, which can be found at www.rasuvo.com or call 1-855-33MEDAC (‍1-855-336-3322). You are encouraged to report negative side effects of prescription drugs to the FDA. Visit www.fda.gov/medwatch, or call ‍1-800-FDA-1088. © 2017 Medac Pharma, Inc. All rights reserved. MP-RA-0464 September 2017 Rasuvo is a registered trademark of Medac Pharma, Inc.